For three decades, we’ve been a place that has welcomed, respected and promoted our immigrant staff, friends and restaurant family. Out of respect for our staff’s vote to support Thursday’s immigrant civil actions in Chicago and elsewhere, we are closing Frontera Grill, Topolobampo, Xoco and Fonda Frontera on Thursday. Cruz Blanca and Leña Brava will remain open Thursday, with 10 percent of gross revenue headed to Illinois Coalition for Immigrant and Refugee Rights. Good for you! We are supporting our community locally in Bloomington, IL. We will continue to patronize your establishments & provide support. This was a slap in the face to my wife (who is a LEGAL immigrant) and all other legal immigrants. Mr. Bayless basically allowed himself to become a tool of the radical leftist agitators who are trying to take over this country. By supporting the grouping of illegals with legal immigrants he has lost our respect . Despite our having enjoyed his shows over the years, we will no longer support him in any way. By the way my wife is a nurse. How would he have felt if a loved one went to the hospital, but could not get help due to people not showing up for work? His actions were irresponsible to say the least. S. West, your wife and you are dissapointed? Probably your Wife forgot that she IS an immigrant too! and that if she feels comfortable in this country now, is because she married you! Solidarity is a very important value! does not belong to the right or to the left! it is a Human Value! dissapointment? for you ! señor Reyes, you are an immigrant or the son of immigrant parents. You need to educate yourself about why people come to this country! How that need is related to the social conditions, the economy of those countries backed up by USA government, keeps its people oppressed and mistreated for years. People come here for a better life, to work hard, to find education for their children, relief from persecution! Read, look for information, be human! Gracias Señor Bayless. Su solidaridad e integridad se aprecian! Me. Bayles, you are great! your restaurants are excellent, food and employees! and now with your action, you have gain my total support! Love your restaurants, and your shows. You have always brought the warmth of Mexico’s food, people closer to all of us. And now it is time for positive standing of support to a community that is really all of us. Thank you! Thank you for your support and solidarity for our people’s cause!!! You are a true human being!! Thank you for you support of the immigrant community. I have always admired & respected you for your skill. I now have a deeper respect for you for showing solidarity to immigrants. Thank you. I have always admired you for your skill. I now respect you for showing solidarity to immigrants. Thank you so very much, for doing this and standing up for what is right! is my favorite restaurant. A third generation of Leffs is carrying on our tradition. We all support your Thursday closing and we support immigration rights. Onward! We applaud you and your show of support! Thank you! It’s never been more important to stand up for what’s right or to do our part to save our country and our world, to save ourselves. Anything any of us can do contributes toward the whole. Thank you for doing something noble and meaningful, and thank you to your immigrant staff for working so hard to make dreams come true. Rick, where was your support/outrage in 2012 when Obama deported 400K illegals. It was a record number! Most any president has ever deported! Trump hasnt even come close to that number! YOU WERE SILENT!! YOU KEPT YOUR BUSINESS OPEN! You are a hypocrite!! I always enjoyed your shows. WILL NEVER WATCH AGAIN! Very sad you had to politicize your restaurants! You should just stick with what you know, especially when you call out one president but not another. Flying into Chicago tomorrow and looking forward to dinner at Frontera Griill. Disappointed but totally supportive. Thank you for honoring the wishes of your staff. Thank you not for loving Mexico but for showing that this is not about ilegals. This is for immigration and human beings for the right of being treated as such. I so appreciate your love and support for Mexicans and our culture, good luck and I hope everything gets better soon! Shoulda stayed out of politics Rick. Can’t respect a guy that wants to incorrectly promote a political stance. We are not an anti-immigrant country, we simply and rightfully expect immigration laws to be followed. Your staff should not be taking any offense (nor it being promoted by you) to the expectation that the immigration process be adhered to. It is a slap in the face to those of us who came here legally, often after patient years of waiting. Rick is being the best kind of American citizen, one who takes his First Amendment rights seriously (as we all should, especially when people like Bannon tell respected journalists to shut up), and who values and listens to his staff at a time when employee rights to be heard are demeaned and disappearing. The GOP was not always this stupid and hard-assed when it came to immigration. Presidents Reagan and GHW Bush would not have promoted the kind of narrow and cruel ideas and practices we are witnessing now from Trump (who once hired illegal immigrants himself, when it suited HIS purpose). However they got here, if immigrants are now contributing members of their respective communities, then we need to streamline the path to full citizenship. Are you paying everyone for the day? You get a day off and your employees get shorted a day’s pay they cannot afford to lose. Notice this is not scheduled for a weekend day that is the most profitable for you and the restaurant. Stay out of politics and cook good food. We use your products and now will continue to do so. Thanks for the understanding and recognition. We have to make this world a better place for all to live and work in. Too bad that you are falling for this charade. Long time fan-very disappointed that you are falling for this scam. Is it paid time off for your workers? Because that is support. Need to make that clear please. Legal immigration I support. Illegal immigration NO. Lets make sure we don’t send the wrong message to the illegal ones in our midst. Thank you Rick for supporting your employees, many of them immigrants themselves, and for caring enough with economic commitment through your support of the larger cause on behalf of immigrants from across the world. 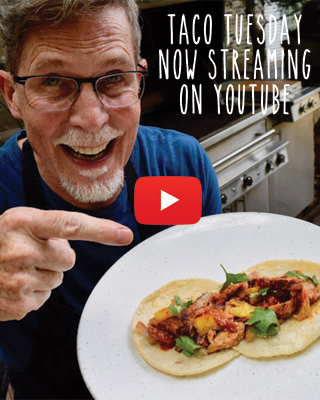 Gracias Señor Rick Bayless por apoyar a Nuestra Raza,,,Dios lo recompensara,,,Y que Viva México! Most of us had relatives come through Ellis Island and do it the”legal” way ! Good luck moving forward. However we will no longer be visiting Fresco in old orchard. Or RED O in Santa Monica. Will you be closed on Presidents Day to honor Americans? I admire and respect your humanitarian efforts to welcome, respect and promote immigrant staff. American was formed by so many diverse cultures, we must stand up to defend what we believe in. Gracias Sr. Bayless!!! Rick, please ignore the very small number of haters who posted here. I love your restaurants but I love your support of your employees and their just cause even more. I will try to dine with you more often as a result of your advocacy for immigrants. Wonderful gesture, Chef Bayless. I look forward to my dinner at Leña Brava on Thursday. Thank you so much for supporting your employees in exercising their first amendment rights! I always look forward to eating at Frontera, where I can get good food, often in a sea of “fast food” awful alternatives. Yay for you. Looking forward to buying extra at my next visit. Thank you, this is what makes America great, doing the right thing. I will be in tomorrow to show my support. Thank you! We are all immigrants in this world and honoring our nomadic instincts is a good thing. How is it that our neighbors in Mexico have to wait upwards of 10 years to request residency in the US whereas other countries wait less than 2 years? We promised to defend MX that’s why they don’t have armed forces like we do. Now we attack them? Who is the bigger threat now? Nicely Done Chef! This business grinds to a halt without the contributions of our brothers and sisters from across the border.